At this point in the blog narrative I introduce Harry, joke of my story, jester of my narrative, foil of my ridicule. My stooge, my fool, the Luddite who vacantly winds his watch every morning. Harry: the name drawn and slurred as if Hemingway found him in a bar in Venice. He is Hal, plain Hal, in the morning, hungover and slumped. He is Hank in his leisure suit. He is Henry on the dotted line. But in my stories he is always Harry. Did he have a precursor? He did, indeed he did. In point of fact, there have been a plethora of precursors, all of whom felt their world as they knew it would come tumbling down were the slightest detail revealed and their privacy violated in my writing. My friends read me, not for pleasure, but rather because they're hoping I will somehow give away some minuscule detail of their private lives so that they might swoop down like harpies to eat my liver. I'm kidding of course. Poor Nabokov must be rolling over in his grave. 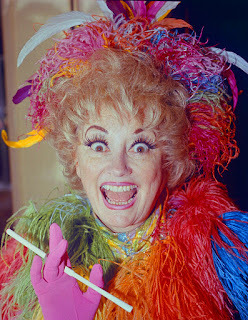 My first thought was to run with the idea of Phyllis Diller, whose onstage persona had a husband whom she called Fang. Being male, I thought of having a female Fang on whom I would pin my mockeries of the human race, but that did not seem fair to my spouse (is the plural of spouse spice?). She objected. Phyllis Diller at her home in Brentwood, Los Angeles. In the writing workshops we learn early that one should never assume that the narrator equates to the author, so I'm quite comfortable with the idea of Phyllis Diller onstage as a fictional public persona, similar to but not equal to the real Diller. And a professional like Diller might have a fever of a 102° and feel like she's been hit by a Mac truck, but she's going to take all the necessary anti-fever, anti-flu, and pain killing drugs so that for her hour onstage, she's going to be that same persona, no matter how badly the private person feels. That's professionalism: it's like McDonald's in Seattle should be gastronomically equivalent to McDonald's in Key West (I know there are McDonald's in Moscow and New Delhi, but it's my experience that internationally they craft their hamburgers to local tastes: it's probably not a good idea to flaunt beefy hamburgers in a predominantly Hindu culture). So I never assume the person onstage, much less the people in her stories, like Fang, were real. But when I taught high school English, the first thing my students would say when confronted by a Shakespearean sonnet was, "Shakespeare was in love." ("They made a movie about it.") It's called the authorial intent or the intentional fallacy, and it means a presumption that a story or poem contains a rich vein of autobiographical nuggets that we can sift through to understand why an author writes a piece and why he wrote it a certain way. "Hey, Mason," Harry calls. "I read how you wrote that I am a fictional character." "And this morning you were writing about how disgusting it is that Harry picks his feet in Poughkeepsie." "Um, yeah, well, what of it?" "Well, I feel like you're making fun of me in your blog, and I don't like it." "Do you pick your feet in Poughkeepsie? Is that what you're telling me?" "I don't wanna be in your blogs, Mason!" The original Luddites did not fear technology. They were angry because the mechanization of their jobs was putting them out of work. Cottage industry refers to a period when manufacturing, particularly weaving, was being done in homes, but with the rise of industrial looms, progress shifted manufacturing from homes to factories and from handiwork to steampowered machinery. Population shifted from countryside to cities. This shift created slums with atrocious living conditions and suffocating poverty. It created cries for reform in the works of Charles Dickens, Victor Hugo, Karl Marx, and Emile Zola. In literature it created the Romantic movement, which embodies a nostalgia for the pastoral, not out of treacly sentimentality, but as a backlash to the squalor in which the working class found themselves. Vigilante groups to smash the machinery changing the world seem a historic inevitability. Wikipedia says the Luddites were named after "Ned Ludd, a youth who allegedly smashed two stocking frames in 1779, and whose name had become emblematic of machine destroyers." There are important differences between the Luddites of the Industrial Revolution of the 19th century and the Luddites of the Information Technology Revolution of the late 20th and early 21st centuries. Both physical and electronic books have become the almost exclusive chattel of Amazon.com. As physical media fade from view, so too book and record (and CD) stores disappear. In fact the revolution endangers nearly all "brick & mortar stores" (the neologism necessitated by the change). But the revolution is not yet complete. Mail of the sort delivered by the US Postal Service has radically changed, and as a drowning man scrambles for a life ring, the USPS is scrambling for new alliances—with UPS, for example—to stay alive. Cars will soon be better drivers than the people inside them, and this will greatly ease fatalities, insurance bills, and traffic jams, which are created by slow waves of human braking overreaction. Knowledge itself rushes to the Internet, and while the reference section may not yet be complete, there's enough out there that the superficial question on a point of curiosity or the quibble behind a bar bet can be settled in a matter of minutes. Less than forty years ago I flew from my Houston employer's offices to a client company in Bakersfield, California, to install a megabyte of memory on the client's machine. The installation was no more complicated than installing the 32-gigabyte micro SD card that I plugged into a new camera yesterday, but the cool million that the clients paid for the memory justified a smiling technician to come with the card to install it: power down the machine, move some pins on the motherboard to open up the memory space, slide in the memory card (a circuit board about one foot square), and push the plastic levers to make sure the card was seated, then power up. Ten minutes. If memory were still selling for a dollar per byte, that SD card would have cost me $32 billion instead of $13. I carry what, in the day of my Houston-Bakersfield trip, I would have called a supercomputer at the intersection of science fiction and incredibility. Now in my pocket is a machine that can make travel reservations; make a video call to anyone in the world (also equipped with a connection and the same inexpensive equipment); look up almost anything; call a cab (or an Uber); order anything; let me watch TV & movies; take courses from elementary school all the way up to college level (I'm studying Chinese); do my banking; order pizza; flirt, woo, propose & quarrel; socialize; find a job; work; run; track orders from UPS; and feed imaginary kitties. Very soon this pocket computer (or smart phone, if you insist) will take a great leap forward as a replacement for my wallet by allowing me to use credit cards electronically: I will just tap my phone against some sensor at the merchant's point of sale. Already my phone holds movie tickets and airplane boarding passes. It might take a while, but eventually my driving license will take up digital residence inside my phone as well. I revel in what my phone can already do, and I look forward to seeing promises for the future fulfilled. But Harry hates all this technology: he is a Luddite in the new sense of the word. Harry specifically hates the new technologies that are changing the world. Attitude embodies my decision to succeed or not before I lift my hand to summon the Force. If I only try, then my effort already contains its failure. Nike would agree with me and Yoda: just do it. About the technology that has permeated our society with finally open arms, Harry feels the whelm. Where I carry my phone, he has an empty space. Where I have a ROKU set-top box, he has an old-fashioned cable box without even a DVR. Harry is a devoted Luddite. He always has a bad word to say about any new technological solution, and just mentioning Google in any context causes him to snarl, claw at the turf, and foam at the mouth. He always has a justification: it doesn't really work; it's overrated; it's not necessary. Harry frets about how hard it is to find a bookstore or about how the (printed) newspaper is shrinking. I tell him those aren't the only things disappearing: cable is disappearing too. The dinosaurs who use these things are dying, and the new generations are using the new technology. I suggest he join the Amish. The anger that Harry vents on practically anything with a transistor is really a cover for a fear of technology. Is he afraid he'll break it? Does it ruffle the feathers of his intellectual insecurity? I've told Harry these are unnecessary: in the beginning, technology belonged to the nerds, but user friendly has been the buzz word since the 1980s, and by now user interfaces have gotten downright chummy and robust: they won't take me down the street to the pub for a black & tan, but it is pretty straightforward to get them to do what I want them to do, and my mistakes won't break anything, but I will get explanations of what I did wrong. I don't have to understand how a TV works to watch it, and neither should I have to understand how computers work in order to use them. Their jobs are to make my life easier, and they are finally succeeding. Harry does have a point: there are times when things don't work because they are new and still buggy (as in having bugs; not as in Amish transportation). But more and more the new technology does work as it should. If I'm a Whirlpool customer, I'm in great luck, and the success of progressive companies will drive even the slackers to catch up in time. Right now Generation X is in the prime of its career: its members earn more money than anyone else. They were raised with technology from childhood, so their demands for personal technology will drive the market, and digital information technology will become even more entrenched as new generations come along. The other day, even Harry broke down and bought an iPhone, and it occurred to me that he might have been right all along, but in a way he never vocalized. I was struck by a vision of our world in which we march down the materialist path, made blissfully happy (and efficient) by our electronic toys and gadgets. I know this, but, rather like one of the Pied Piper's kids, It's not going to stop me from the march.